If you are a doughnut aficionado, then you might have been going back and forth to you favorite donut store like Krispy Kreme to ticker your taste buds. However, your donut cravings might cause you to shell out some of your resources just to satisfy your yearning. Why not try to make your own homemade doughnut recipe ? However you like them – glazed, cream filled, chocolate – who knows, yours might even taste better than the other donuts being sold. Learn how to make and cook your own doughnut right at your home with this easy and fun recipe I found on the Internet. Mix the flour and baking powder and sift the, together. Beat the eggs and add in sugar together with butter, milk, and vanilla. Add the dry mixture and mix thoroughly until soft dough is achieved. You can also chill the dough for two hours. Roll dough into small balls on a floured surface and cut with donut cutters. 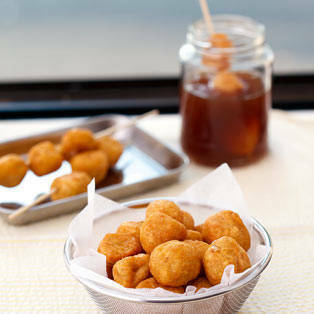 Using a deep fryer, fry the dough in 375-degree oil until it turns golden brown. Remove the donut from the oil and drain using paper towels. And while the donuts are still warm, shake with sugar and top it with your chosen glaze, cinnamon mixture, or icings. This is one recipe on how to make homemade doughnuts. I’ve figured you can also make donuts using the yeast-raised recipe which makes light and airy donuts. Whoa! I’d definitely have to try that other option, too. Meanwhile, this donut recipe can be an alternative to your breakfast routine. Enjoy!